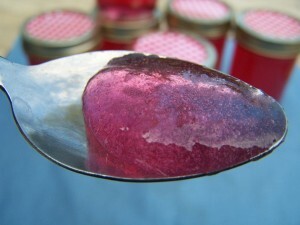 I mentioned Red Bud Jelly in my last Saturday on the Farm post. I was able to finish a batch yesterday. While I think the Red Bud flowers themselves taste like lettuce when eaten raw, the jelly has a fruity taste to it. 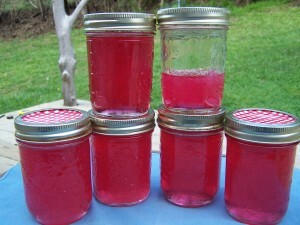 I used this Red Bud Jelly recipe. I was sure I had to packages of pectin left from last year. However, when I went looking, I only found one. So I had to cut the recipe in half. I got 5 jars and one little taster jar out of half the recipe. Since I had already made enough juice for a full batch, I put the rest of the juice in the freezer. I’m thinking it will be just fine for making the jelly after I get more pectin. 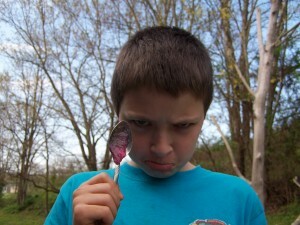 I like the Red Bud Jelly. Some of the kids liked it, one said he didn’t, but he’s only 11 so I forgive him. lol It has a light fruity taste. I thought I’d be able to taste the lemon juice, but I couldn’t.